These products are digital downloads NOT physical products!! Unless you order CDs. Our ESL/EFL/ESOL English for Kids courseware is a hot item on most English teacher's shopping lists with good reason. Whether you are using our materials as a full time course for your school curriculum or supplementary materials for your young learners' lessons, there is something here for everyone. Take a tour of the contents and see for yourself. Over 300 exercises in this book. They include: Printables worksheets, Flashcards, Powerpoint presentations, Video presentations, mp3 audio and all the tools you need to deliver a fantastic lesson to ESL/EFL Young Learners. There is something in here for everyone.The ebook has a built-in search engine which makes it easy for you to find stuff. Click on the book cover to browse the content.The links to files are broken in this sample view. Following in the same tradition of our kids course ebook 1 is ebook 2. Unlike ebook1, ebook 2 has 11 units and a wide range of resources. This explains why teachers find these resources a great deal of help.. Whether you are using our materials as a full time course for your school curriculum or supplementary materials for your young learners' lessons, there is something here for everyone. Take a tour of the contents and see for yourself. Over 200 exercises in this book. They include: Printables worksheets, Flashcards, Powerpoint presentations, Video presentations and all the tools you need to deliver a fantastic lesson to ESL/EFL Young Learners. There is something in here for everyone.The ebook has a built-in search engine which makes it easy for you to find stuff. Click on the book cover to browse the content.The links to files are broken in this sample view. Ebook 3 is finally here. This is what you have been waiting for. Packed with tons of resources, ebook 3 has 11 fully developed units with complete sets of materials from PPT , Flashcards, Video Slides and Printables. There are written lesson plans for each unit so that even a new teacher can teach a fantastic lesson with little or no time on lesson planning. Experienced teachers know what I am talking about when I say less time on lesson planning. Take a tour of the content by clicking the book cover. Over 200 exercises in this book. They include: Printables worksheets, Flashcards, Powerpoint presentations, Video presentations and all the tools you need to deliver a fantastic lesson to ESL/EFL Young Learners. There is something in here for everyone.The ebook has a built-in search engine which makes it easy for you to find stuff. Click on the book cover to browse the content.The links to files are broken in this sample view. Ebook 4 is finally here. There are eleven units in pack This is what you have been waiting for. Packed with tons of resources, ebook 4 has 11 fully developed units with complete sets of materials from Lesson plans, PPT , Flashcards, Video Slides and Printable worksheets. There are written lesson plans for each unit so that even a new teacher can teach a fantastic lesson with little or no time on lesson planning. Experienced teachers know what I am talking about when I say less time on lesson planning. Take a tour of the content by clicking the pack cover to your left. Over 250 exercises in this book as : Printable PDF handouts, PDF/PPT Flashcards, Powerpoint presentations, Video presentations and all the tools you need to deliver a fantastic lesson to ESL/EFL Young Learners. There is something in here for everyone.The ebook has a built-in search engine which makes it easy for you to find stuff. Ebook 5 is finally here with lots of resources. Packed with tons of resources, ebook 5 has 10 fully developed units with complete sets of materials from Lesson Plans, PPT , Flashcards, Video Slides and Printable PDF handouts. There are written lesson plans for each unit so that even a new teacher can teach a fantastic lesson with little or no time on lesson planning. Experienced teachers know what I am talking about when I say less time on lesson planning. Take a tour of the content by clicking the book cover to your left. Over 260 exercises in this book. They include: Printables worksheets, Flashcards, Powerpoint presentations, Video presentations and all the tools you need to deliver a fantastic lesson to ESL/EFL Young Learners and teenagers. There is something in here for everyone.The ebook has a built-in search engine which makes it easy for you to find stuff. Ebook 6 has a lot more variety of resources. As the learners go higher, there are complexities in teaching. We understand that. That is why some units of this pack contain fantastic TV quiz games in swf. format. There are 10 fully developed units with complete sets of materials from Lesson Plans, PPT , Flashcards, Video Slides, Flash SWF TV style games and Printable. There are written lesson plans for each unit so that even a new teacher can teach a fantastic lesson with little or no time on lesson planning. Take a tour of the content by clicking the pack cover on your left. There are over 300 exercises in this book. Just all the tools you need to deliver a fantastic lesson to ESL/EFL Young Learners & teenagers. There is something in here for everyone.The ebook has a built-in search engine which makes it easy for you to find stuff. Click on the book cover to browse the content.The links to files are broken in this sample view. ESL Course Materials All Teachers Should Have! Save crazy amounts of energy and lesson planning time. It's all been done for you. From beginner to intermediate levels. Instant access to downloads after purchase. Emails are sent to all buyers with download link(s) within 24 hours. Heroic customer support! Video tutorials on how to use the files. CHECK YOUR EMAIL AFTER PURCHASE. We will contact you within 24 hours. Make sure your email is correct and mailbox not FULL!!! If you order CDs, make sure your delivery address is correct and don't forget your PHONE NUMBER!!!!! NOTE: CDs/DVDs are only sent to customers who choose the CD delivery option at purchase. There is a difference in price. AN EVEN BETTER DEAL HAS ARRIVED. Ebook Packs 1, 2 and 3 only $ 59 dollars. Very Best Value- 6 eBooks - $ 119 to download ALL. Those who asked for CDs have been heard. Now you can choose between a download only option and a download + CD/DVD option. CD/DVDs arrive in 6 to 10 working days. Note that there are differences in price on each delivery option. DISCOUNTS AVAILABLE BELOW! Board Games, Card Games, Powerpoint Games and Interactive games are just some of the Fun ESL and Education resources we offer. Our games help students practice Grammar, Vocabulary, Math Skills and more. We also have a number of game templates which teachers and educators can easily use to create exercises for learning. ESL Grammar & Vocabulary eBooks. 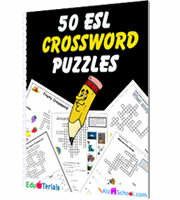 50 ESL PDF Crossword Puzzles - For Beginners, Elementary to Pre-intermediate Levels. Teach and practice over 500 essential English words in 50 fun crossword puzzles. Students, especially young learners are crazy about word puzzles. Using puzzles is a good way to teach and practice new vocabulary with the spellings of the words. The puzzles are in PDF formats which makes it easy to print and use. In most of the low level puzzles, we have provided fantastic graphics to further clarify vocabulary for visual learners. You don't even need to be an experienced teacher to use these puzzles. We provide answers to every puzzle. You are therefore going to download over 100 pages of puzzles and answers. Why not try to click on the icon to take a video tour or simply download and try these samples. 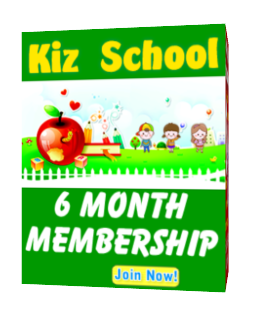 Kiz School - Practical English Lessons for Young Learners - Your Home School & School Teaching Solution? ESL Games World : Free ESL Fun Games for Teaching, Printable Board Games,PPT Games, Card Games, Interactive Games, Hangman, Jeopardy, Snakes and Ladders and Game Templates. ESL-Galaxy.com : Best Free Resources for Teachers and students. Printable ESL worksheets, grammar & Vocabulary worksheets in high PDF quality. Chinese-iLab.com: Learn Chinese online for free, videos lessons, mp3 audio, PDF audio scripts and interactive games and quizzes for mandarin learning. English-4kids.com: Resources for teaching kids,videos, worksheets, games, puzzles, and more for ESL kids teachers and students. ESLTower.com : Best Free Resources for Teachers and students. Printable and interactive ESL exercises, grammar & Vocabulary worksheets and quizzes for all levels. Download a variety of grammar, vocabulary, phonetics, puzzles and education eBooks in PDF and zip file formats. Our content-rich Kids course can be used as a full-time ESL school course or supplementary materials for teaching ESL kids. Teach English and other subjects with Powerpoint presentations. PPT makes your teaching come alive.It's is a must for teachers. We have a collection of cool math resources for kindergarten, preschool, 1st to 6th Grades. Easy math teaching materials! Join Kiz School - Get it ALL Plus More!! KizSchool.com- Practical English Lessons & Resources for Kids. KizSchool.com has Partnered with Download-ESL.com to offer you this discount! Why do I need Kiz School? Simply because we provide the best materials in the industry for teaching ESL Young Learners. Join Kizschool.com and Teach ESL Young Learners with Ease!!! At Kiz School, we offer the most practical tools and materials for teaching English to Young Learners. These materials will serve teachers and parents well as they help kids learn English in a fast and fun way. Kiz School provides: Video Tutorials, PPT, Interactive Games & Quizzes, Printable PDF Worksheets & Flashcards, among others. You don't need to be a professional teacher to use our materials.It is an effective, affordable private and public teaching solution for parents and schools. * Interactive Placement Tests to judge Levels of learners.